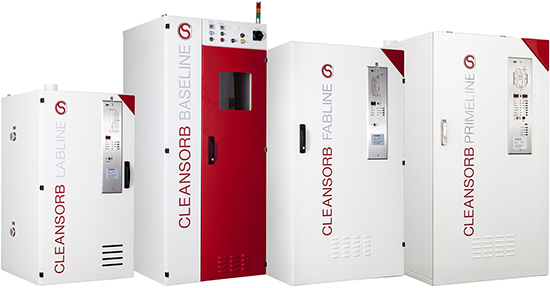 FAB SUPPORT AB has chosen to work with CS CLEAN SOLUTIONS who uses advanced chemisorption technology to design waste gas abatement systems unmatched in their scrubbing efficiency, yet absolutely simple to operate. FAB SUPPORT has over 20 years of experience in supporting this dry bed chemisorption technology developed by CS CLEAN SOLUTIONS. 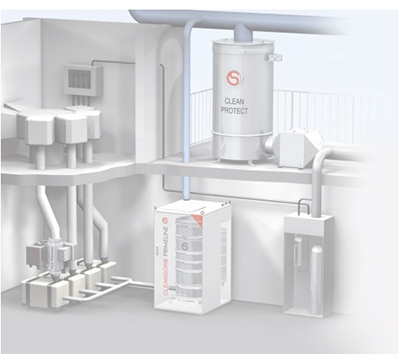 The CLEANSORB dry absorber systems consume neither electricity, water, nor fuel. Moreover, there is no contamination of precious water resources due to discharge of contaminated waste water – a major benefit in terms of eco balance. The CLEANSORB granulate converts hazardous gases into stable inorganic salts at ambient temperature. It is the most elegant and environmentally friendly purification technology of exhaust gas abatement. A wide range of CLEANSORB model sizes are available to meet the needs of all our customers, from small-scale university researchers to round-the-clock wafer fabrication. One column of CLEANSORB granulate typically binds several thousand liters of hazardous gas into safe, solid by-products. 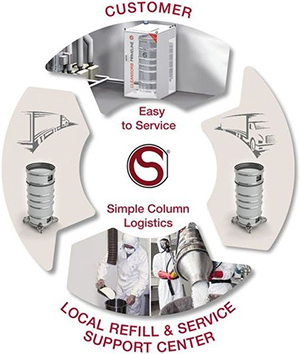 We offer optimized solutions for all process sizes and applications. Used CLEANSORB columns are not discarded, but refilled by FAB SUPPORT with fresh granulate and with minimal generation of waste material. – CLEANSORB dry bed removal of process waste gas. – CLEAN-PROTECT safeguard against emergency gas release. – CLEANVENT mini cartridge for gas cabinet vent lines. Please contact us for assistance in choosing the right scrubbing system for your needs.